Chipotle Pepper Hot Salt (1.1 oz./31g) Ingredients: Salt, chipotle powder, chili powder, sugar, maltodextrin, calcium silicate (prevents caking), hickory, garlic, vegetable oil, spices. Chili Lime Hot Salt (1.1 oz./31g) Ingredients: Salt, sugar, chili powder, maltodextrin, calcium silicate (prevents caking), garlic, lime, spices. Jalapeno Pepper Hot Salt (1.1 oz./31g) Ingredients: Salt, jalapeno powder, sugar, chili powder, maltodextrin, vegetable oil, basil, calcium silicate (prevents caking), spices. 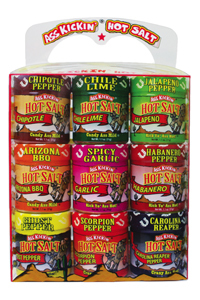 Arizona BBQ Hot Salt (1.1 oz./31g) Ingredients: Salt, vegetable oil, chili powder, sugar, garlic, maltodextrin, paprika, calcium silicate (prevents caking), hickory, spices. Spicy Garlic Hot Salt (1.1 oz./31g) Ingredients: Salt, garlic, habanero pepper, spices. Habanero Pepper Hot Salt (1.1 oz./31g) Ingredients: Salt, habanero pepper, chili powder, sugar, maltodextrin, calcium silicate (prevents caking), hickory, garlic, vegetable oil, spices. 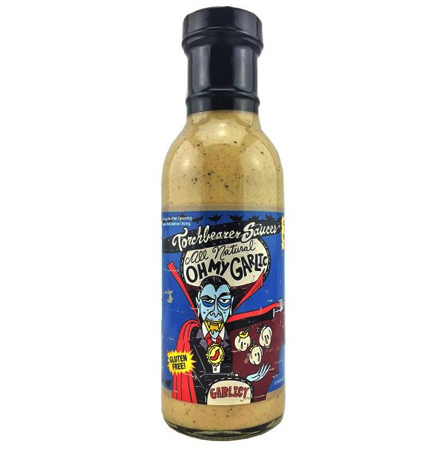 Ghost Pepper Hot Salt (1.1 oz./31g) Ingredients: Salt, ghost pepper, chili powder, sugar, maltodextrin, calcium silicate (prevents caking), hickory, garlic, vegetable oil, spices. Scorpion Pepper Hot Salt (1.1 oz./31g) Ingredients: Salt, scorpion pepper, chili powder, sugar, maltodextrin, calcium silicate (prevents caking), hickory, garlic, vegetable oil, spices. Carolina Reaper Hot Salt (1.1 oz./31g) Ingredients: Salt, Carolina reaper pepper, chili powder, sugar, maltodextrin, calcium silicate (prevents caking), hickory, garlic, vegetable oil, spices.